Vicino, being simple and convenient in use, impresses us with the structure of replaceable cell and dual circuit protection. With 3.5ml e-liquid capacity, top e-juice filling and bottom airflow control, Vicino atomizer can perfectly match the compact yet unique device. Moreover, the classic silver and black colors will make Vicino quite popular. Three colors- Reuleaux RX200S arrive! Clear battery display on Wismec Vicino Kit! New stock of Reuleaux RX200S arrives again! All innovative features on Reuleaux RX75! A starter kit, still adjustable airflow control! 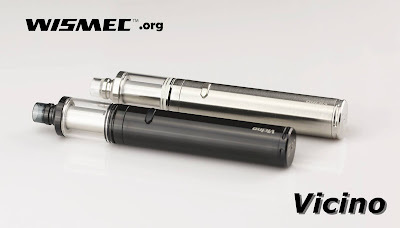 New stock of Wismec Vicino Kit arrives!